On Friday, 14th July 2017 I attended the Clippa as a guest. For those who haven’t heard about it, CLIPPA is the poetry award given by CLPE for published collections of poetry for children. This year’s judge was Rachel Rooney, who herself won the CLIPPA in 2012 and was my Arvon tutor in 2015 when I dragged myself up to Yorkshire to immerse myself in the world of children’s poetry. As a kid, I loved rhymes and still do. The songs and rhymes in Tamil which is my mother tongue were often rhyming ones. And the bulk of our popular music is from the movies – as you know most Indian cinema produces sing-alongs and musicals. Much of our poets make their living as lyricists for movies. As much as they publish poetry collections and recite poetry – the rice and lentils come from the movie industry. Here is Vairamuthu - who writes amazing poetry in Tamil as well as being one of the most popular contemporary lyricists in the movie industry. I apologise ahead that this is in Tamil and of course would not make any sense if you don't speak the language. But I just wanted to demonstrate a little bit. This is his poem about his mother. So most of the songs I know growing up, and most of our poetic references to life, philosophy, friendships and heartbreaks are lyrics of movie songs not unlike the pop music lines folks in Britain quote to me (which I should admit goes over my head). So it was no surprise that my first attempt at writing was poems that rhymed. I was eight I think, when the regional radio came for some recording in our children’s club – Mum had arranged all of us to perform something and as a 8-year old with an entourage of two – my sister and the sister of my neighbour – two 4 year olds were put on the spot. I made up a 4-line song (rhyming of course) and they recited it with me and we were on radio! I still know the song and sing it for my nephews much to the amusement of my family. Then when I was 13, I read a poem in a textbook and loved it. I ended up visiting the poet –literally landing on his doorstep and being inspired to write my own poems. You can read that story here. So I wrote all sorts of poems. Perhaps influenced by popular culture, I even wrote love poems even before I knew what love was. I still write love poems every time someone breaks my heart or makes it flutter. But I don’t usually share it with the world. I still write poetry all the time but I rarely call myself a poet. I’m not sure whether that’s because I write more rhymes than not. I read a lot of poetry for sure – more now than before. I enjoy listening to spoken word performances but I never claim I’m a poet. For a while I wrote 1000s of haikus – I loved putting nature and life lessons together. I had abandoned writing in my mother-tongue long before – I was more proficient in English than I was in my own language. The problem with rhymes for me was that they didn’t work when I wrote them especially in English. It took me years to figure out that my stress, my accent and my pronunciation was not how native English speakers speak. And therefore what I thought rhymed didn’t rhyme or fit the beat for others. Anyway many people kindly and often in an unkindly way pointed out that my rhymes don’t work. I wrote free verse, sent them out and even got a couple published here and there. But most came back. And for a while I wrote poetry only in my notebook and focussed on picture books. Which is a different kind of poetry anyway. 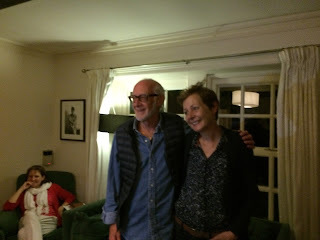 When I took the Arvon course taught by Rachel and Roger McGough in 2015, Rachel was not only patient with me, she even encouraged me to write both free verse and rhyme – except for rhyme of course I needed more work, more persistence, and perhaps another person to help. And she still remembers the poem about EATING SOAP that I wrote. Yes persistence does help. I can now proudly say that I’ve placed ONE poem in an anthology that’s coming out in 2018 and I have a rhyming picture book come out in 2018 too. So there’s no holding back anymore – I’m going to be writing poetry for a long time to come. But I doubt I would ever call myself a poet. At least not yet. I digress. The reason I was at the Clippa was because Rachel had kindly invited her Arvon students to the ceremony. And what a lovely treat it was. The readings from the poets, the children’s performances and of course Chris Riddell live drawing the event – it was all brilliant. And I got to meet so many friends and made new friends too. 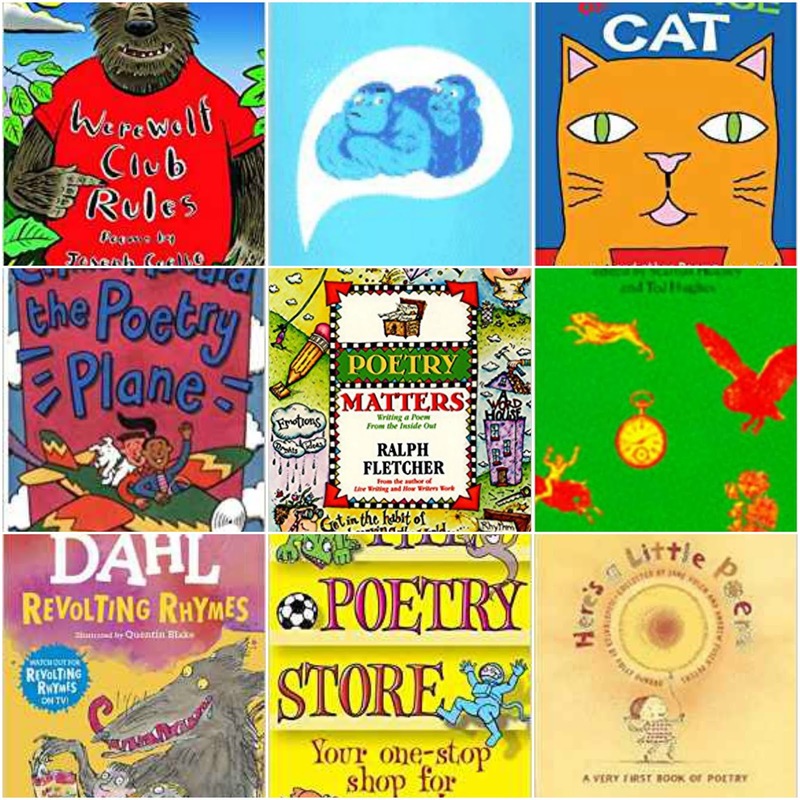 So to celebrate the Clippa and to encourage most of us to read poetry, here is a selection. Some of my favourite poems are simple, yet full of wisdom. Here is one that’s so evocative. And every time I read it, it invokes perhaps a new meaning. I also love the Thought Fox by Ted Hughes. 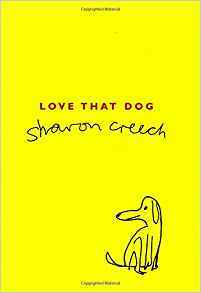 One of my favourite novel in verse is LOVE THAT DOG by Sharon Creech. From India, I’ve just started discovering many poets who write for adults. But for children, I love Ruskin Bond for sure. Read some of my recommendations here. Many of my friends are poets and a group of them showcase their work here. Do check them out. The list of contemporary poets I love is too long to list here. 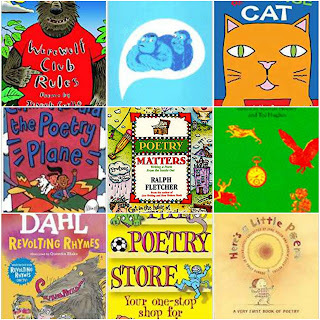 I have perhaps read all modern poets who write for children especially. Both from the UK and America. So instead of listing them I thought I’d share less than 10% of my list of poetry books I own. Back to Clippa though! 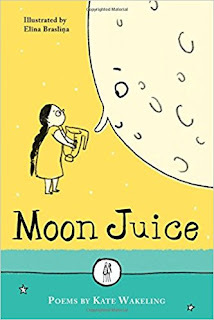 The winner of this year’s award is Moon Juice by Kate Wakeling, illustrated by Elīna Brasliņa and published by Emma Press. If you have not read it yet, check it out! Thank you for a very interesting post. Never knew that you were a native Tamil speaker. I speak very little of the language (married to one though) and I do understand about the lyricism of the Tamil language. I loved listening to the poem in Tamil even though I couldn't understand a word! I could hear the rhythms and repetitions, though. Glad you thought of posting that.